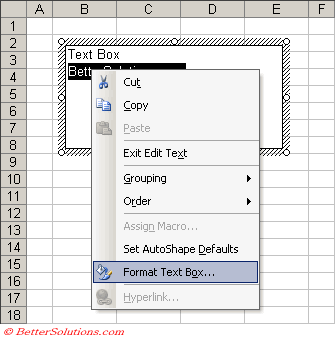 Excel does not offer full word processing capabilities however blocks of text can be added to a worksheet by using a text box. You can insert a text box onto a worksheet using the Text Box button from the Drawing toolbar. Text Box - Inserts a textbox anywhere on your worksheet. 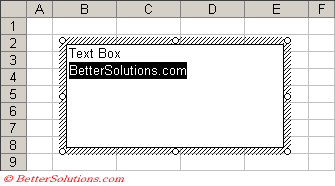 Using a text box provide a way of displaying text that is independent of the row and column boundaries. Drag to draw a textbox to the correct size. The text is left aligned by default. When the text box is selected the border is displayed as dotted lines. A text box can be easily resized at any time by dragging one of the white selection handles. Once the text box is selected you can highlight all or some of the text inside the text box by using the mouse. You can also double click a text box to be taken directly into the text edit mode. When text inside the text box is selected the border is displayed as a hatched-line. The text inside a text box can be formatted in the usual way. 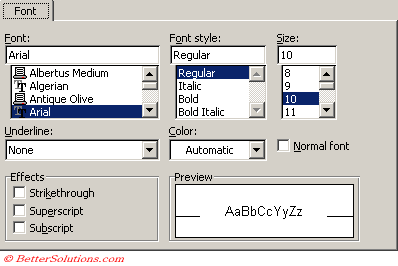 You can quickly display the Font formatting options by using the shortcut menu and selecting Format Text Box. Alternativley you can also use the Formatting toolbar directly or select (Format > Text Box) from the menu bar. The only tab that is displayed is the Font tab. A text box can be easily deleted by selecting the border and pressing Delete.